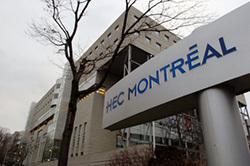 HEC Montreal was founded in 1907 as a French-language business school located in Montreal, Canada. It offers undergraduate, graduate and postgraduate programs, with over 13,000 students making up the student body. HEC Montreal was the first school in North America to be awarded AMBA, AACSB and EQUIS accreditations. Only two schools in Canada hold these three prestigious and international accreditations. In addition, Bloomberg Businessweek ranked it within the Top 30 International Business Schools in 2015. HEC Montreal’s has 127 partner schools in 40 countries, expanding its global outlook to allow students to have a diverse learning experience.